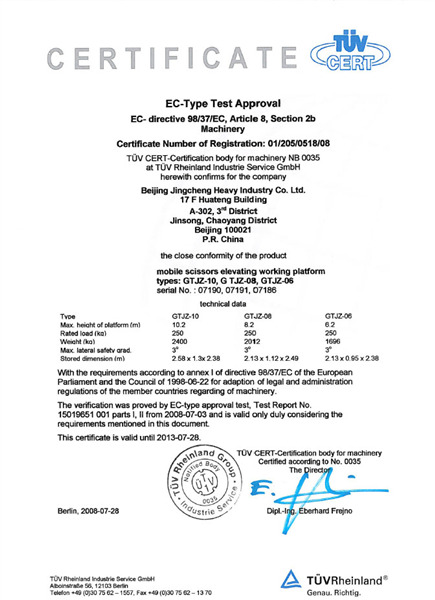 Tüv Group signed the CE certification for self-propelled scissor lift GTJZ<?xml:namespace prefix = st1 ns = "urn:schemas-microsoft-com:office:smarttags" />06/08/10 in Berlin, indicating that these three models are legal to enter into European market. After one year’s arduous work and multiple improvements, JCHI’s self-propelled scissor lift GTJZ06/08/10 finally got CE certification. In the meantime, the CE certification program for our other products is under way. More and more products of JCHI will enter into European market in the future.